Sphalerite is a zinc sulphide mineral that is quite rare in gem quality. Top grade specimens are prized for their exceptional fire or dispersion, which is higher than that of diamond. Since sphalerite is a relatively soft stone, with a hardness of only 3.5 to 4 on the Mohs scale, it is not suitable for rings. It can be used in pendants if set carefully. But it is mainly a gem for the collector. Sphalerite is the chief ore of zinc, and gem quality specimens are sometimes found in zinc mines. But most sphalerite contains iron, and it is black in color and completely opaque when the iron content is high. The rare gem quality specimens have a low iron content and a high degree of transparency. Colors range from yellowish to golden brown, orange, red and green. 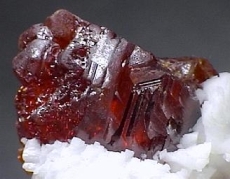 Gemologically, sphalerite forms as cubic crystals, like diamond, and has perfect cleavage in six directions. It has a refractive index of 2.368 to 2.371, just slightly less than diamond, and higher than demantoid garnet, sphene, zircon and corundum. It is one of the few gems with an admantine or diamond-like luster. 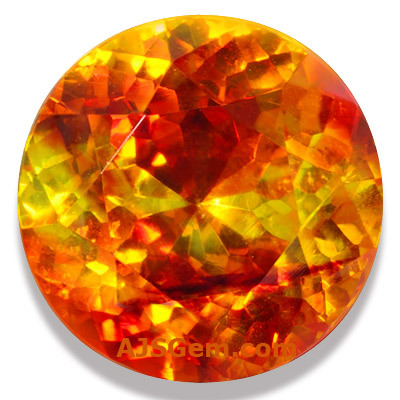 But it is sphalerite's dispersion or fire that is truly unique -- it has a dispersion rating of 0.156, significantly higher than demantoid (0.057), sphene (0.051) and diamond (0.044). Sphalerite has a density or specific gravity of 3.9 to 4.1, about the same as sapphire. Sphalerite is usually given a brilliant cut or Portuguese cut to maximize its brilliance and fire. Sphalerite is usually completely untreated. Some of the finest and largest sphalerite in the world comes from the Aliva mine in the Picos de Europa Mountains in the Cantabria region on the north coast of Spain. Zinc was mined in this region for many years, and when zinc mining was no longer economic the mine produced some exceptional transparent toffee-colored sphalerite in big sizes. These extraordinary specimens became well-known by collectors of rare gems, and fine faceted Spanish sphalerites can be found in major museums and private gem collections. The Aliva mine was closed in 1989 and the mine is now part of a national park. That is why the Spanish sphalerite is now quite scarce -- all of the gems in the market were cut from material mined years ago. Finding large clean stones of good color is now very difficult. Though sphalerite is found in other locations around the world, such as Mexico, Peru and Bulgaria, the Spanish sphalerite still has no rivals for quality.